SNS11 Have you ever created your own profile online that others can see, like on a social networking site like MySpace or Facebook? SNS12 Is your profile currently visible? SNS13 Is your profile visible to anyone, or visible only to your friends? 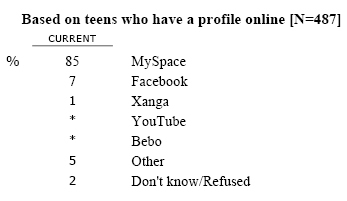 SNS17 About how often do you visit social networking sites? SNS18 What are the different ways you use social networking sites? Do you ever use those sites to…? SNS21 We’d like to know the specific ways you communicate with your friends using social networking sites. Do you ever…?